Robert Jason Productions features state-of-the-art recording, utilizing some of Nashville's finest musicians and singers. The goal is to provide the best "musical canvas" upon which the artist can express, with heart and soul, their God given talent. Robert believes every artist, every song is unique and requires experience, care and vision to enhance that uniqueness. With over 30 years as a hit songwriter, Robert understands that a great record starts with a great song. He takes all the time necessary to assure the lyrics are tight and focused, the melody remains memorable, and the musical arrangement serves the song. This process is often the difference between radio success, or not. Robert includes this most important step as part of all his productions at no extra charge. For our non-songwriting artists, Robert calls upon some of the most talented songwriters on the planet, who trust their songs to Robert's talent and expertise. As always, the artist will have the opportunity to review dozens of prospective songs, choosing only what they, and Robert feel worthy. Then, and ONLY then, is the recording process set in motion. In either case, whether artist or artist songwriter, Robert works one on one, refining, guiding, and inspiring the artist in their quest for that once in a lifetime vocal. 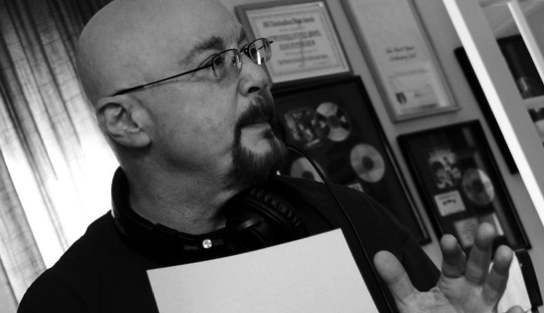 With 30+ years as an award winning studio vocalist in Dallas, Los Angeles and Nashville, Robert understands what it takes to bring out the best in a vocalist. It is Robert’s unshakeable belief that “Radio Ready” Master Quality production should be affordable to everyone. A concise, itemized breakdown of all expenses for your project will be provided, whether it be 3 songs or an entire CD. Robert's goal is to provide the very best production possible, in the most creative environment possible, at a fair and honest price. We welcome you to dive into this website, perhaps listen to some recent productions, and get a feel for what RJP is all about!